The Normans were the victors of the Anglo-Saxons at the Battle of Hastings in 1066. 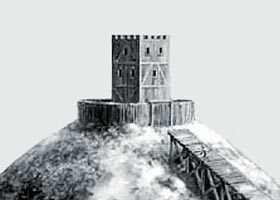 The indigenous population had been conquered and the strategy of building the vast network of Motte and Bailey castles ensured that the Normans maintained control. Life for the Normans was good. Their successful invasion of England meant wealth for the Norman invaders. Lands were divided between Norman Lords and they built the Life in a Motte and Bailey Castle. Life in the Norman Motte and Bailey Castles depended on the rank of the people who inhabited the castle. The Lord of the Castle and possibly his family would live in the most protected part of the castle - the Tower or the Keep. Servants would be expected to provide food for the Nobles and soldiers. The Soldiers were well paid and lived within the Bailey of the castle. Other occupations within the Motte and Bailey castle were the Blacksmiths - to keep a supply of arrowheads, the Stable hands to help with the horses and the kitchen staff. Like the Feudal system itself, life in a Motte and Bailey castle was a pyramid shape with the Lord at the top of the pyramid - literally living the high life! And the quality of life decreasing according to the position of the inhabitant! Life in the Norman Motte and Bailey Castle Bailey - the occupants of the Bailey were the soldiers and the servants - blacksmiths, cooks, storekeepers, stable hands etc. The objective of the Motte and Bailey castle occupants was to control the surrounding area. The Motte and Bailey Castle was not used as a refuge or a retreat where men cowered behind walls - it was there to dominate the indigenous population. The Norman soldiers therefore spent a lot of their time patrolling the surrounding area. Foot soldiers could cover up to 30 miles in one day and horse soldiers could cover much wider areas. The soldiers were the victors - they had conquered the Anglo-Saxons - they would have been hated and feared. No doubt they would have made life difficult for the Anglo-Saxons in their area and 'confiscated' and items which would have made their life easier. The life of the soldier would have centred around the Bailey - patrolling and practising and improving their weapon skills. Their leisure time would have been spent resting, some gambling and praying! The Normans were a Christian army and the Norman Invasion of England had been sanctioned by the Pope and was seen as a Crusade. If the Tower had a Great Hall then there would be some forms of entertainment - the richer the Lord the better and more varied the entertainment. Meals would be also be taken in the great Hall and religious observances such as Mass would be taken here. Life in the Tower would also be noisy, dirty, busy and smoky - there was little privacy for any of the inhabitants. Life in the Norman Motte and Bailey varied according to the rank of the inhabitants. Understanding the lives of the people who lived there and the actual layout of the Motte and Bailey Castle helps to stimulate the imagination and what life actually must have been like!